A dish we can highly recommend, we have this one on a regular basis as it tastes amazing and is easy and quick to prepare. An amazing chicken dish that is loved by people of all ages. All the way from Italy, so do enjoy this fab dish! Cut the chicken thighs or filLets into pieces. Season with salt and pepper and fry in coconut until golden brown. 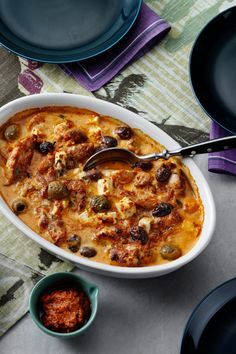 Place the fried chicken pieces in a baking dish together with olives, feta cheese and garlic. Add the pesto mix. Bake in oven for 20-30 minutes, until the dish has turned a nice color. Serve with baby spinach or other leafy greens and your favourite low carb dressing.